Stock photo of Port aux Basques as seen from the Marine Atlantic ferry the M/V Caribou as it arrives in Newfoundland, Canada. The charming town of Port aux Basques is seen from the Marine Atlantic ferry, the M/V Caribou. 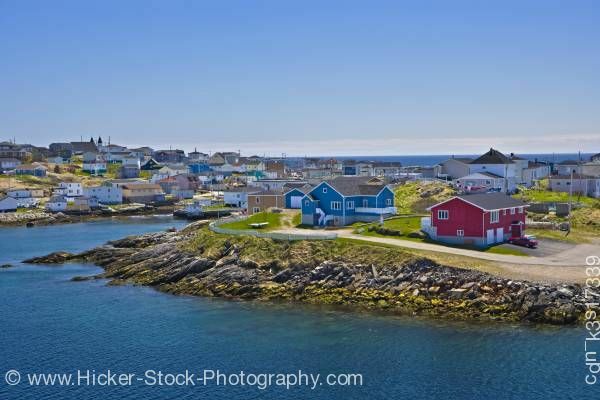 This stock photo shows the charming town of Port aux Basques as seen from the Marine Atlantic ferry the M/V Caribou as it arrives in Newfoundland, Canada. This wonderful view of the town of Port aux Basques is shown from the M/V Caribou ferry. Colorful homes of blue and red sit close to the rocky shoreline. A asphalt road runs along the sides of the homes. The small town is abundant with homes and buildings sitting along the hillside view and along both sides of the shore. The deep blue waters follow around the rocky shoreline and disappear into the distance. A clear blue sky adds to the backdrop of the delightful hillside town. In the distance, low on the horizon are a soft layering of clouds. Port aux Basques as seen from the Marine Atlantic ferry the M/V Caribou as it arrives in Newfoundland, Canada.